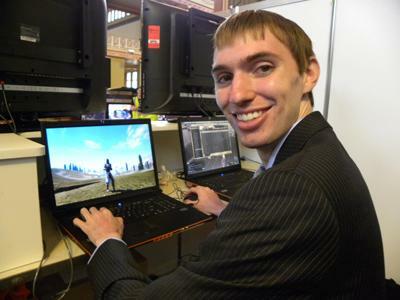 In 2004, Australian gamer David Storey made headlines around the world when he purchased a virtual island in the online game Planet Calypso for a cool US$26,500. At the time, it was the highest price that had ever been paid for a virtual item. In the intervening years, Storey has turned Treasure Island into a thriving community with an estimated value of over US$100,000. What's most amazing is that at the time of its purchase, Story was just 22. GamePro: Hi David. So, Planet Calypso and the Entropia Universe. What’s it all about? David Storey: Planet Calypso is a massive multiplayer online game [MMO] which is part of the wider Entropia Universe. It's heavily geared towards entertainment, socialising and also, business, due to its cash economy. You can mine resources to manufacture items, buy weaponry and armour to hunt creatures for loot, open a beauty parlour or shopping centre, buy up property, build creature parks — there's a whole range of professions available, each with its own associated costs and income potential. Basically, the world's there for you to get in there and have fun or to make a business out of it. GP: How did you first find out about Planet Calypso? What drew you to it over other MMOs? DS: I first heard about [the game] in the late 1990s when it was still under development. It had no subscription fees and was free to join, which grabbed my attention. The whole cash economy thing was also intriguing. I was in my teens and thought "I can make money from this? Wow, cool!" I later rediscovered it in 2002 when it was in its public beta phase. It went gold in ‘03 by which time I was a regular player. I liked it because it was a fun online game that didn't cost much. You could get in there and try it out for free, and potentially get more out of it then just playing a computer game. As for other MMOs, I used to play Asheron’s Call and World of Warcraft for a bit, but they never really grabbed me the way Entropia does. Entropia has so much freedom — you’re not locked into a class or caste, or a specific area in the game world. In most MMOs, you have to get up to level 452, or whatever, before you can use a certain sword. In Entropia you just buy the sword! GP: So you were interested in the financial side from the very beginning? Yeah, the cash economy aspect really got my attention. Back then, I bought an in-game item for a couple of hundred bucks; now it's worth a few thousand dollars. So that was pretty cool. In 2004, Treasure Island came along [a new habitat within the game's world]. I bought that and things went up from there. Zachurm ‘Deathifier’ Emegen poses for the camera. GP: How did the purchase of Treasure Island come about? I did an evaluation of the stuff on the island, and the stuff that would be coming in the future. It was a bit vague in parts, but I knew there would be houses on it, unique creatures; the beginnings of an economy. So I did the sums and talked to some guys I knew who had money — I was still a broke student at university at the time. I got a bunch of details from the developers; specifically, how long would it take to get certain aspects up and running on the island. Surprisingly, some of this stuff still isn't finished today; there are still bits and pieces that need to be finished off. Anyway, I approached the investors who said "look, we'll consider it. We need you to do a business plan". So I went and did a business plan, which I'd never done before. I took it back to them and they said "yeah, we'll back it. Here's the cash. Good luck!" So then we had the [online] bidding war which everyone was watching. All the service centres, both major and minor, were packed out — we crashed the system a few times because so many people were watching the auction. It was crazy, I just kept thinking "follow the plan, follow the plan!" And then we won. GP: So how did your friends and family react when they heard you bought a US$26,500 virtual island? DS: Once I explained it, they were like "...um okay. We can kind of see where it's going". They thought it was a little bit unusual but it's not like they went crazy or anything. Then a year later, it was profitable and they were like "wow, you did it. You actually succeeded in making your money back. Well done".